The Canadian Rockies are big. REALLY big. This spectacular mountain range stretches up and down Western Canada for hundreds of kilometers, splitting the border that divides Alberta and British Columbia. Because of this, there are literally hundreds (if not thousands) of beautiful lakes and mountain-scapes that will make you feel like you’ve died and gone to heaven. With so many options to choose from, how does one decide where to go? Well, the simple answer is that it depends on how/where you arrive in the Canadian Rockies. If you take the train from Vancouver to Jasper (that’s what we did – read about it here), we suggest you put Maligne Lake at the top of your itinerary. Maligne Lake is the largest glacially formed and fed lake in the Canadian Rockies and Spirit Island (pictured above) is the heart and soul of Jasper National Park. Jasper was the starting point of our road trip through Alberta’s Rocky Mountains. Because we took the train to Jasper instead of driving, we picked up a rental car at the Jasper train station once we arrived. Maligne Lake was the first stop on our road trip. The scenic drive from Jasper to Maligne Lake is an adventure all on its own. The windy road zigs and zags through the towering mountain peaks of Jasper National Park, passing Medicine Lake along the way (another lake worth exploring). The park is loaded with wildlife so it’s best to have a co-pilot on constant watch. We spotted this black bear wandering along the river between Medicine Lake and Maligne Lake. He was a big boy on a mission, so we gave him his space. Even though I know you want to, don’t get out of your car and approach a wild bear for that postcard photo opp. Seriously, don’t do it. To get the full Maligne Lake experience, we jumped on a 90 minute boat cruise that took us to Spirit Island (that’s where we captured the top photo). Well, to be fair, the full Maligne Lake experience should actually include a canoe, but we had our toddler and infant with us, so the boat cruise was the next best thing. There are no roads to Spirit Island, so you must take a boat to get there. The magic of toddler curiousity. He was glued to the window the entire trip. The boats aren’t very big, seating about 30 people. We missed our 10:00 sailing because we were given bad information about the drive time from Jasper to Maligne Lake (it actually takes an hour to get there), so we jumped on the 11:00 sailing. It was a Saturday in peak season, which meant plenty of departure times were available. That said, tours book up fast so reservations are recommended. The tour guide on our boat was a recent university graduate that decided to spend his summer hanging out in Jasper giving boat tours – pretty sweet summer job if you ask me! He asked the group to shout out where they were visiting from. It was interesting to hear the variety of responses. Most were from the United States and eastern Canada. It was awesome to see so many other Canadians exploring their homeland. This was the boat we took to Spirit Island. It took about 40 minutes to get there. The only downside to the tour was that we only had 15-20 minutes to explore. We found ourselves rushing to take photos while still allowing ourselves time to soak up the scenery. It’s hard to do both. We later learned that there’s an evening boat cruise designed specifically with photographers in mind. 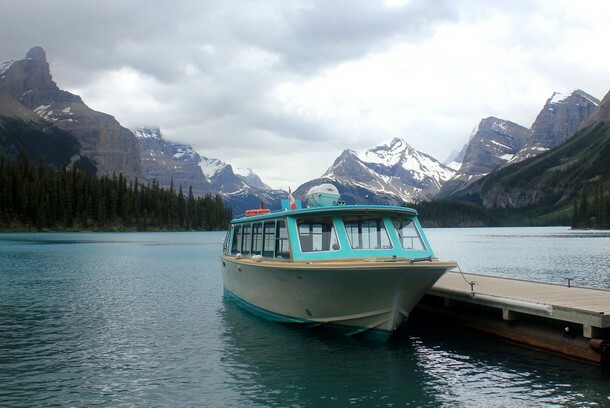 This tour is 2.5 hours long (instead of the standard 1.5 hour trip that we took) and it brings a professional photographer onboard that helps guests find the best spots to shoot Spirit Island and the Hall of the Gods, located at the south end of Maligne Lake. There’s a short loop trail that serves up some spectacular views of Spirit Island and the massive snow-capped mountain peaks that surround the lake. The turquoise glacial water is unreal. Although we were left speechless by the incredible mountain scenery, Braydon was mostly interested in throwing sticks and stones into the lake. He continually teaches us that adventure really is a matter of perspective. We try to not to “oversell” a destination because everyone has different expectations about what makes a destination great (or not great). For the ultra-adventurous mountain man, this lake may not be remote or isolated enough. After all, you can reach the lake by road and there are a few boats on the water. But what makes this destination special is that it offers the young and old an opportunity to witness Alberta’s secluded natural beauty. Our toddler can’t hike or canoe for 6 hours, so that limits our ability to go deep into the mountains. This boat tour allowed us to experience the solitude and raw beauty of the Canadian Rockies with our entire family. And that’s important to us. The price for the boat tour is $64 for adults and $32 for children. 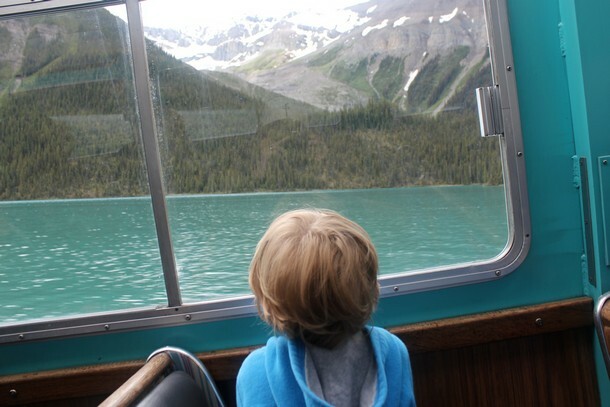 If you don’t have a vehicle you can take a bus to Maligne Lake or book daily tours that depart from Jasper, but we recommend you rent a car and explore at your own pace (especially with kids). Leave yourself at least an hour to travel from Jasper to the Maligne Lake ticket office, without stopping for photos along the way. There is plenty of parking at the lake for all vehicle types. There is a cafeteria and gift shop at the lake, so you don’t need to worry about bringing food and beverages. Prices are reasonable. Many thanks to the good people at Travel Alberta for providing us complimentary tickets on the Maligne Lake boat tour. As always, expressed opinions are entirely our own. We enjoyed the boat tour and think everyone that visits Jasper should visit Maligne Lake. What a magnificent view of the mountains! The last thing I would do is to approach a bear, whether he’s on the wild or in the zoo. They’re not as cuddly as your teddy.. but I do love the shot of that black bear. I think a great destination doesn’t always have to be remote with the most complicated route, but as long as it’s pleasing in the eyes and is quite relaxing like that of Maligne Lake.. it’s so gorgeous. Agreed. Keeping your distance from bears is definitely recommended! 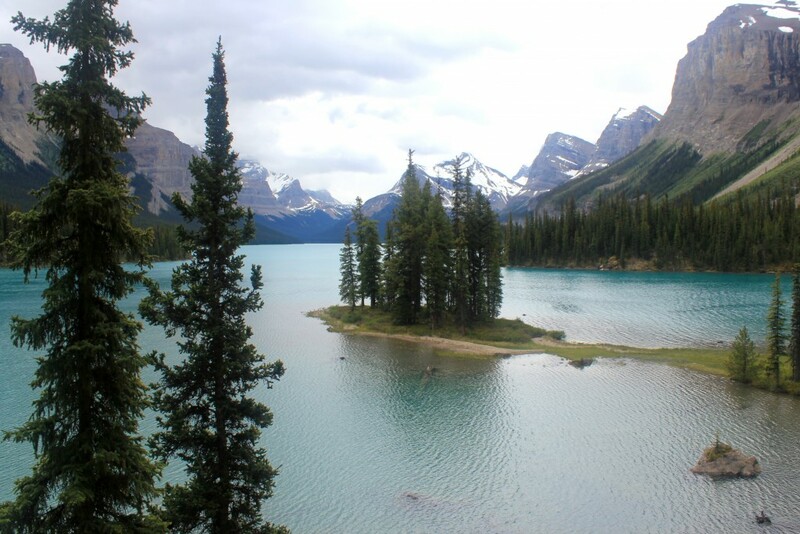 I loved Maligne Lake and Spirit Lake in the Jasper area – we took the boat out to Spirit Island also. Such a gorgeous part of the world. It really is, isn’t it?! We hadn’t heard of the lake prior to planning our trip. I only wish we had more time to soak it all up! I’ve only ever been to the area once it was snow covered. Must go back in the Summertime, it’s incredible. That is absolutely beautiful. I saw some great scenery on a tour through Yukon years ago, but not quite like this. I miss the Rockies. wow, this sooooo beautiful!! We were recently in Vancouver and drove around the nearby coast, we so wanted to just start driving to Jasper, it is so beautiful in that part of the world. Thanks for sharing your tips on exploring the Jasper area!! I worked at Maligne Lake for 3 summers as a boat driver/tour guide. Best job in the world hands down! If anyone heads up to the lake, have the sirloin burgers fresh off the grill and the bread pudding for dessert … so good! Hi, fantastic photos. Had been trying to convince my husband to take this tour 🙂 He wanted to explore places on his own and not through a guided tour boat ride and your post about toddler travel made it easy for me to finally make him say yes 🙂 We are too visiting with a toddler, any suggestions as to what time of the day should the cruise be taken to get good photos (in terms of sun’s position) my husband loves photography and we don’t want to be facing the sun while cruising to the island. Wow! What a beautiful place. A photography tour sounds pretty awesome for a guy like me (I make YouTube videos). I would love to visit this place with my two kiddos! Hopefully I can make it happen when we sell our house to buy an Airstream and travel fulltime while making videos! Thanks for the bucket list destination! It looks amazing! Loved the photos. I have 4 kids, and the youngest is 4 – every time she sees water, she wants to stay there throwing sticks and rocks. It’s the first time I came to your blog. 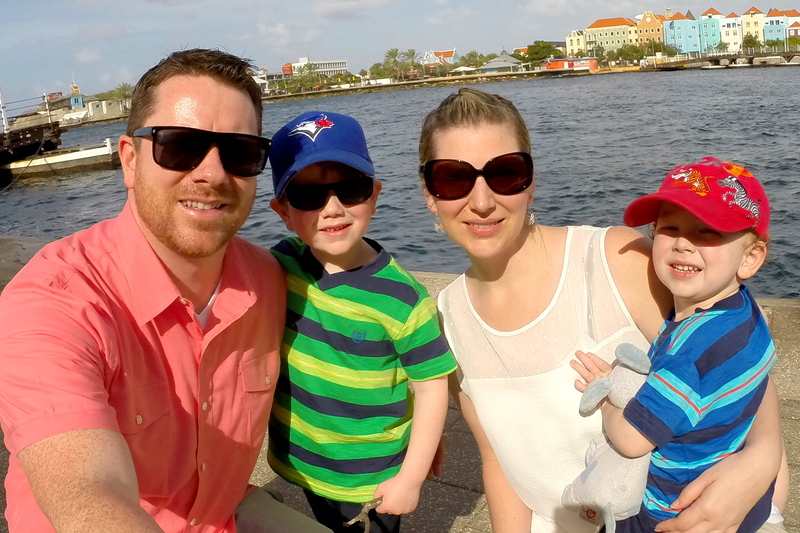 As a newbie traveling family, I love to see what other families are doing! I’ll follow you!